To a generation raised on the ubiquitous image of the "Greys" and their penchant for abductions, cases involving non-human entities of unknown origin (aliens, time travelers, visitors from a parallel universe, a secretive parahuman race that has been on this planet since before our own species appeared, etc. )in previous decades had a distinct flavor of their own. While researching old publications, I came across the October-November 1975 issue of Ovnis - Un Desafio a la Ciencia (UFOs - A Challenge to Science) that was published in Argentina in the mid 1970s, with contributions from some of the luminaries of the time. It was published by Dr. Oscar A. Galíndez with artwork by Jorge Vallejos. Some of the samples shown below bear the signature of "B.O.C. ", whom I believe to be Benjamín Galíndez - the publisher's father. 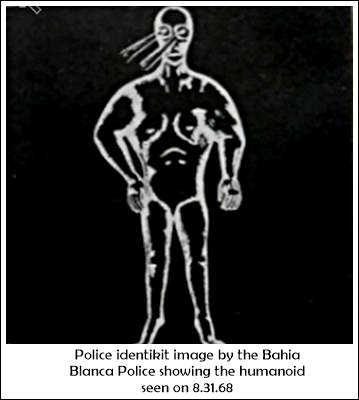 One article, penned by Prof. Oscar A. Uriondo, describes the August 31, 1968 case of Mrs. Susanna Larroude de Salazar, a resident of the UFO-prone city of Bahia Blanca, who at the time was in her kitchen with two small children. The young wife and mother heard someone banging against the door to her house, and upon lifting the shutter that covered the peephole, she was startled to see "a strange, opaque being" outside. She reportedly felt paralyzed as the entity withdrew, emitting a sound reminiscent of "echoing peals of laughter". The entity suddenly disappeared upon reaching the fence that marked the entrance. On June 24, 1967 Mrs. Dora Egger de Torres was resting beside her husband at one clock in the morning. Her slumber was abruptly interrupted by a loud buzzing sound that hurt her ears. Wehn she turned to look, she was taken aback to see an oval light in the corner of the bedroom. 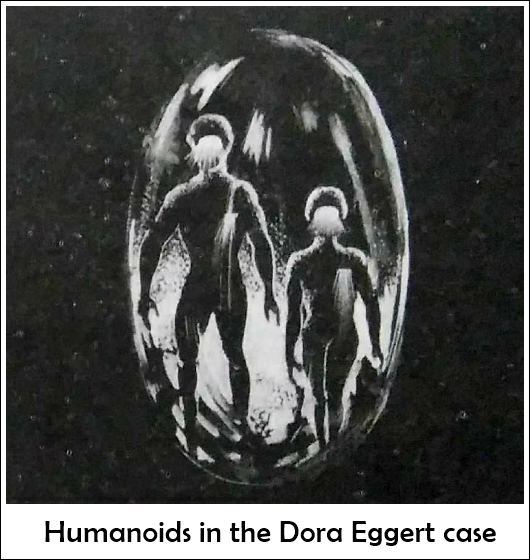 Two human-looking entities were contained within it- one of them was tall, standing about 2 meters, and the other was smaller, no more than 50 or 60 cm in height. 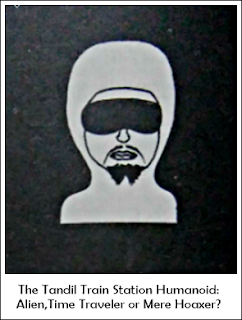 Both wore metallic outfits and helmets with clear visors (she said they were "plastic") covering their faces.As in the previous case, the witness was completely paralized and unable to utter a single word. 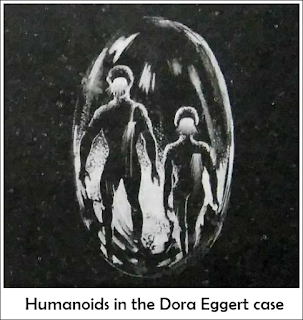 The oval light and its humanoid occupants became gradually smaller as the light faded against the background, a shuttered window. They ultimately vanished. On June 27 1968 in Cerro de las Rosas, Province of Cordoba, three boys were riding their bicycles when they noticed an oval object hanging over the trees. The object had a structure described by the boys as a "propeller" which spun at considerable speed, issuing white and blue lights. Suspended above the object were two people - a man and a woman - floating in the air. The boys described them as being "extraordinarily tall" and wearing luminous clothing. They took each others hand and descended slowly into the object with the "propeller". They vanished into the machine - if machine it was - without making a sound, or without any door opening to allow their entry. On March 23, 1973 Roberto Herrera, a twenty-three-year-old engineering student, was on his way to the city of Salta from San Salvador de Jujuy when he witnessed an object described as "two superimposed plates, 5 meters in diameter" landing on the roadside. It was aluminum colored asnd was suspended on ground with what appeared to be struts. The witness suddenly noticed that a manlike entity standing 1.60 meters had emerged from the object (although at no point did he see how this was accomplished - no hatches or doorways were opened). The student was able to retain enough presence of mind to provide a thorough description of the humanoid: it lacked hands, had stubby arms, legs ending in very large, shoeless feet. When Herrera approached, the entity also moved without ever making use of its legs. It then stopped and "was gone", as the onlooker would later tell researchers. An even stranger case occurred on June 25, 1974. The "El Diario" newspaper from Montevideo, Urugay reported that a security guard at a train station in Tandil, some 350 km from Buenos Aires (and a frequent UFO and cattle mutilation scenario, as Inexplicata readers will be aware) had seen a "short, strange figure with deep-set eyes" and passed out shortly after the experiences. Other witnesess at the station reported that an odd little man had descended from a vehicle so strange they thought it had to be a UFO, as it emitted a very powerful light. The object and its occupant vanished as soon as the light was extinguished. As chance would have, there was a police barracks across from the train depot, and policemen allegedly also saw the small figure, describing it in detail. "A creature with a fixed gaze, wearing a lead-colored helmet and dark goggles, a "Fu Manchu" mustache and a goatee. His arms appeared to stem directly from his body, and the position of the window (at the police barracks) kept us from being able to make out anything below his chest." When asked to explain the entity's sudden disappearance, one of the officers replied, "Well...I don't know. Perhaps he rose into the air." The law enforcement officer further added that newspapers and radio programs were often discussing sightings of 'flying saucers' and 'Martians' ocurring regularly in Tres Arroyos and Bahía Blanca. Four decades separate us from these events, which were largely anecdotal despite the presence of multiple witnesses and the involvement of the authorities. However, they remain a disquieting reminder of a fascinating period in UFO history.